This is likely an early example (perhaps 1850s and no later than 1870s) of this form, judging by the entryway. The porch is probably a later addition. Hall-and-parlor and central hallway houses are related forms of the broader vernacular I-house family. 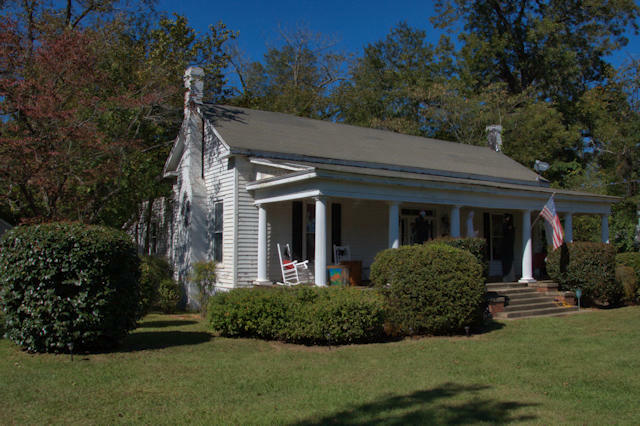 Most I-houses I have encountered are two stories and better known in the South as Plantation Plain; they generally feature shed rooms. More documentation of this example is needed. My grandmother Helen Louisa Stephens Baumgardner and my grandfather Harold Baumgardner and my father Walker and my uncle Stephens (Steve) all lived in this house. There is the “little house” behind the main house where my Dad and Uncle lived (or at least played and slept). It had a full bath and built in bunk beds. It predated the tiny house movement by 70 years or so! Both my grandmother and Uncle had their funerals at First Baptist Church of Tennille. This was my grandmother’s house. She passed back in 1989. My Dad and my Uncle grew up here. I have lots of childhood memories of Tennillle as we used to come down often and I would spend weeks at a time with my grandmother during the summer. I was always told this house was antebellum. It was added on in the back at one time. The front porch columns were more square shaped than the current round ones but were changed when the house was renovated sometime in the last 20 or so years. What were their names, Elliott? I’d love to add them to the post. Thank you for all these photos and historical data. Live in Tallahassee and some are close by. Are you aware of anyone that does a Florida site that’s similar?